Being charged with a crime is an incredibly frightening experience. Criminal charges can have devastating consequences in multiple areas of your life. Not only are you facing potential severe penalties, but the ramifications of a criminal conviction can also destroy your relationships and your career. You need a dedicated Downey criminal lawyer fighting tirelessly in your defense. Having successfully defended thousands of criminal cases, he knows how to launch a strategic defense on your behalf and fight effectively for your rights and future. Contact the firm today at (562) 923-4946 to set up your FREE initial consultation! Attorney Mendez can investigate your case to uncover any facts or evidence that may result in your case being dismissed or charges being reduced. He can construct a compelling defense and demand the jury be held to the standard of proof beyond a reasonable doubt in the battle for your acquittal. Attorney Mendez is a former prosecutor, experience which gives him invaluable insight into the tactics of the prosecution. This allows him to predict the issues your case will present and prepare accordingly. He can also advise as to whether or not you qualify for expungement and assist with this if so. 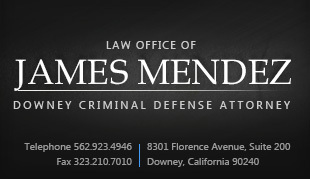 Attorney Mendez offers a free consultation along with comprehensive, practical help for the issues you are facing. He is proud to serve clients with an unwavering level of dedication and will give your case the personal attention it deserves. Payment plans are available, as is Spanish-speaking representation. With a practice devoted exclusively to criminal defense, the legal team has seen and solved all kinds of criminal cases. They can offer seasoned and committed legal help and are available to you 24 / 7k. Contact a Downey criminal defense lawyer immediately for vital help with your defense. We serve clients throughout Downey, Compton, Bellflower, West Covina, Pico Rivera, Alhambra, East Los Angeles, Inglewood, Norwalk, Sylmar Juvenile Court, Van Nuys, San Fernando Valley, La Mirada, South Gate, Lynwood, Paramount, Montebello, Lakewood, Cerritos, Hacienda Heights, and Whittier.